For more than nine weeks now I have been working with a high school in the Central Texas area, getting to know students, teachers, and administrators. Along with a fantastic team of graduate students, we are spending time with an after school digital media club that offers students a range of opportunities to hang out, mess around and geek out. I have also been working directly with two video game development classes on a project we think will offer some insights into creating new kinds of learning environments, learner identities, and youth civic engagement. Part of our research is designed to explore the opportunities for and influence of ‘connected learning’ in the lives of teens. What is ‘connected learning’? It is a concept that the Connected Learning Research Network, a group of researchers supported by the MacArthur Foundation, will be working to develop and refine. 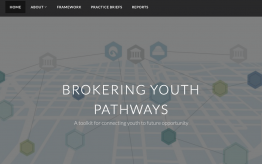 Broadly speaking, connected learning refers to the increasingly complex ways in which young people’s learning ecologies are evolving. It is the notion that, in addition to happening anytime and anywhere, learning happens across the many different networks that teens’ navigate. School is an obvious node in a young learner’s network. But school represents only one node among many others, which includes after school sites, extracurricular activities, online communities, libraries, family, and peer communities just to name a few. When the lines that distinguish each of these is blurred and learning happens fluidly across the different nodes we believe that connected learning — learning that is social, mobile, engaged, efficacious, student-driven, adult-supported, and civic-oriented — is happening. One obvious example of connected learning involves students who are able to connect their out of school or informal learning with learning activities situated in formal learning spaces, namely schools. A number of questions frame our examination of these learning practices: What are the factors that lead to connected learning? Are some youth more likely than others to experience connected learning? How do various social indicators like race, ethnicity, class, gender, and academic orientation influence the likelihood of connected learning occurring? How can schools encourage connected learning? What is the value of creating opportunities for a greater diversity of young people to experience connected learning? The high school we are working with is an incredibly diverse environment. The school is a majority-minority site with whites making up about twelve percent of the overall student population. More than twelve percent of students are designated as English Language Learners. There is some degree of economic diversity though more than half, 55%, of the students are designated as low-income. In many respects the school’s demographics reflect the population shifts that are transforming the eighteen year old and younger population in the United States; specifically, the degree to which U.S. children are more racially and ethnically diverse than ever before. 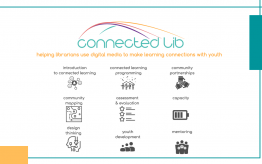 What are we learning about connected learning in this community? 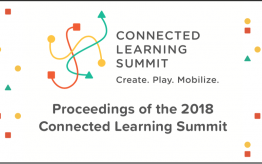 There will be more extensive data collection, analysis, and formal reporting to come but we are beginning to see evidence that connected learning is happening among our students and in a school that is struggling to keep students academically engaged and prepared for meaningful participation in a 21st century information-oriented economy. Some of the early evidence suggest that young people in the social and economic margins are actively building pathways for connected learning for a variety of reasons: to supplement what they view as poorly stimulating classroom experiences; to create rich and rewarding peer and social networks; to move into interest-driven offline and online communities; to develop their digital media production skills in areas such as graphic arts, game design, video, and music production; to foster the development of the civic self; and to develop the skills and competencies they believe hold the key to greater social and economic mobility. Not all of the students we have met fit this description but those distinctions make this community especially fascinating. Why is it that some are developing an orientation toward connected learning and others are not? In just a short period of time we have discovered that young people who are grappling with the hidden and not so hidden injuries of race, ethnicity, class, and language barriers are practicing very distinct notions of connected learning for reasons and in contexts that researchers currently have not explored with much rigor. Doing so will help provide data and insight to those concerned about the learning divides that are contributing to historic social, educational, and economic inequalities. We believe the answers to these and other questions can help address the inequities that continue to shape the lives of the young and the digital.